All reputable dog breeders care about what happens to each and every puppy they breed, even after it leaves their care. Indeed, a good breeder will ask you many, many questions about your lifestyle, experience with the breed, house and property size, show or breeding experience, and any other aspect of your life that may affect the puppy’s future. If your answers to these questions are not satisfactory, then the breeder probably won’t sell the puppy to you. A good breeder will also require that you sign a contract in which you agree to: have the puppy fixed if you’re not going to breed it; notify the breeder if the dog develops any diseases or medical conditions; notify the breeder first if you are no longer able to care for your dog; and, do anything else the breeder health and well-being of the puppy and the breed. If your breeder doesn’t seem to care about the puppy’s future and only seems interested in payment, go to another breeder. 2. The breeder seems reluctant to answer questions about the puppy’s pedigree. 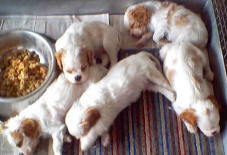 A reputable breeder knows all about the pedigrees of the puppies he or she sells. He or she knows who the parents were and can provide you with each puppy’s lineage, going back several generations. You will also want to register your purebred puppy with the American Kennel Club (AKC). The breeder is supposed to supply you with an AKC registration application with his or her portion already filled out. After you fill out and submit your part of the application, you’ll receive an AKC registration certificate. If the breeder you are dealing with cannot provide you with any documentation or registration papers for either the litter or the parents, be extremely wary. Any potential buyer of a purebred puppy should be able to see the facility in which the animal was bred. Do the puppies and other dogs there look healthy? If not, then the breeder may not be maintaining an appropriate standard of care. This could definitely affect the current and future health of the puppy in which you’re interested. The breeder should also have a record of the puppy’s health care, from birth to the present, and should be happy to provide you with copies. He or she should also guarantee that the puppy is free from any genetic disorders. Any reputable breeder will be happy to give you a tour of their facility. If the breeder you’ve chosen is not willing to let you see where your potential puppy comes from, the breeder may be running a puppy mill. Puppy mills are facilities that breed puppies only for profit, not for the benefit or love of the breed. Often, multiple dogs are crammed into one cage, the living conditions are filthy and the dogs there do not receive the proper nutrition or medical care. If the puppy you want comes from such a facility, it will most likely have serious medical and behavioral issues related to its stay there. If the asking price for your purebred puppy is significantly lower than other prices you’ve seen advertised for the same breed, there may be something wrong with the dog. Perhaps it comes from a puppy mill or has some serious medical issues. If the breeder also sells to pet stores, you can be pretty sure that he or she is operating a puppy mill. Reputable breeders usually concentrate on one or two breeds. If the breeder advertises that he or she has many different breeds for sale, then this is another indication that he or she may be breeding animals indiscriminately, without much concern for set breed standards.